The Logs feature is an integral part of the Inbound console. It is the hub from which users can control their emails. 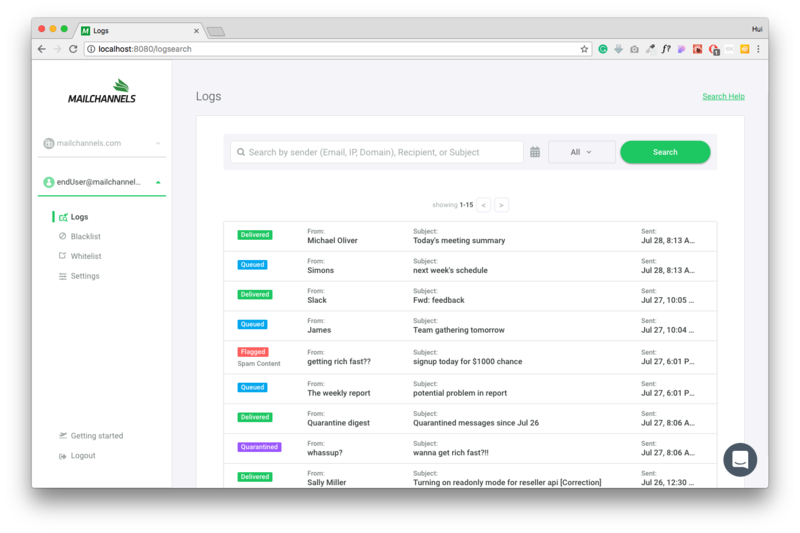 Through Logs, users can search emails and senders, see the status of their incoming email, manage their quarantine, release emails and whitelist and blacklist senders. Once users are signed into the MailChannels Inbound console they will be able to see a log of all incoming email. Through Logs, users can see the status of all recent email transactions related to their account. 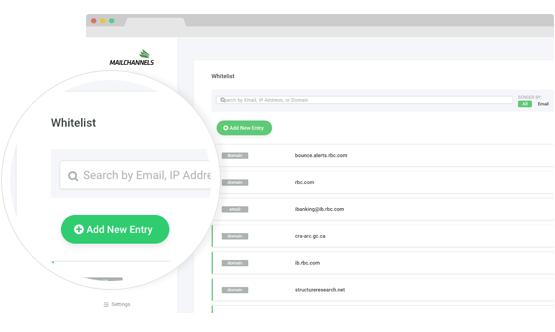 At the top of the Logs page, the search bar allows users to retrieve a particular email or set of emails by sender (email, IP, domain), recipient or the subject. Incoming emails are separated into four different categories within Logs. This email was delivered to your mailbox without issue. Email is being queued up for delivery to user’s mailbox. Email was rejected by Inbound Filter. Email is going to spam folder. MailChannels IQ™ detected spam in this email and it is being held in quarantine. The Quarantine Digest is a daily or weekly email report that provides an overview of all emails that have been Quarantined by Inbound Filtering. Not only can users then release a message straight from the inbox, senders can then be whitelisted without ever having to log in to the Inbound console. 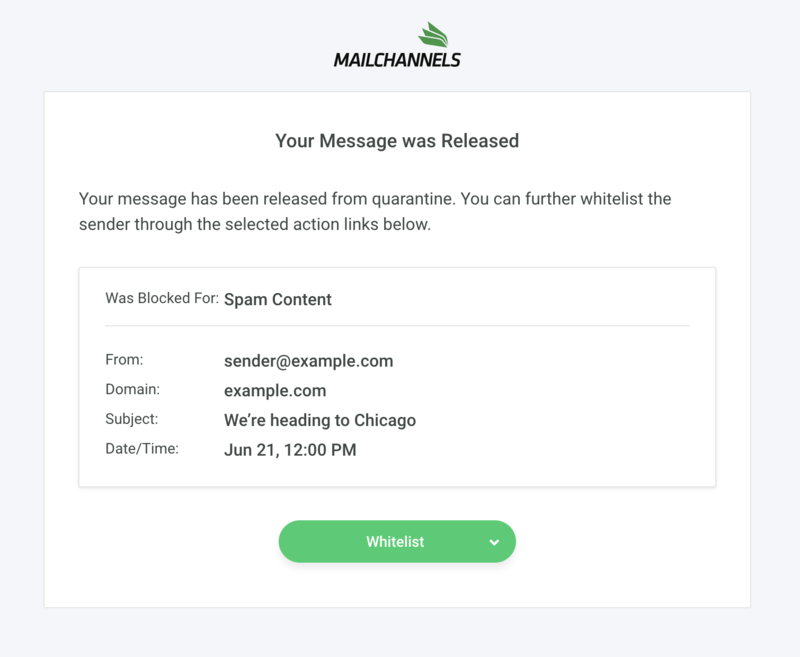 Because false positives are not something that can ever be 100% eliminated, our system allows users to release messages from Quarantine and subsequently whitelist this sender. This means our system can learn and develop and no emails are ever lost to the junk folder. To make thing even more simple and easy, users can choose to have a Quarantine Digest sent to their inbox on either a daily or weekly basis. To read more about MailChannels IQ™, check out our blog post here. MailChannels IQ™ quarantines emails based on the Inbound Filtering analysis. Releasing messages from Quarantine can be done in two ways; in the console or through the Quarantine Digest. The three symbols on the left-hand side of the quarantined email will allow users to release, whitelist or blacklist an email. To release an email, hit the release symbol. The Quarantine Digest provides users with an overview of their quarantines emails with details such as sender, subject, time and the action the user would like to take. Once a user hits the ‘Release’ action button, the release message will allow senders to be whitelisted. In addition to whitelisting senders through the Quarantine Digest, users can also log in and control whitelists and blacklists from the Inbound console. Whitelisting and blacklisting emails can be done in the same way as releasing a message through the quarantine. Select the email you wish to whitelist or blacklist, and click the relevant icon.